This Victorian window was originally in Pratt's Butchers in Hungerford, and had been stored in a barn for several decades. The lead was in poor condition and some of the glass was missing or broken. The client wanted it installed in his farmhouse porch. This would only take two of the panels, which also had to have the original ruby red borders removed and adjustments to the design to fit the available width. I made and installed a timber frame to fit the space in the porch, and made up two infill panels to fill the gaps above and below the Victorian panels. These were in a similar geometric design, and featured a red border as was originally round the Victorian panels. The purple and green glass was chosen as the colours of the Garston Gallopers, the local Morris side of which the client's family are enthusiastic members! The original frame with three panels in "Victorian Geometric" style. 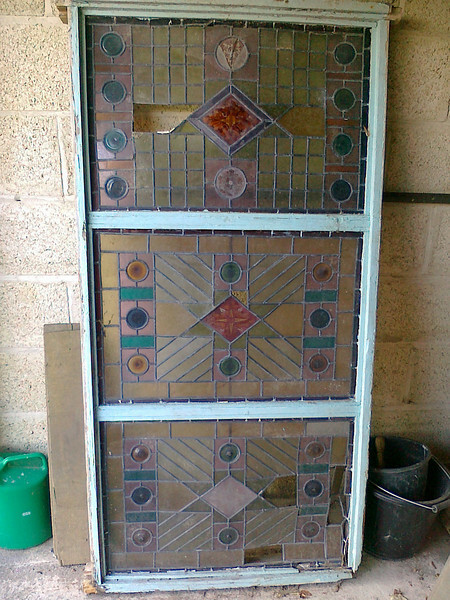 The lower panel has been stored for possible future restoration.